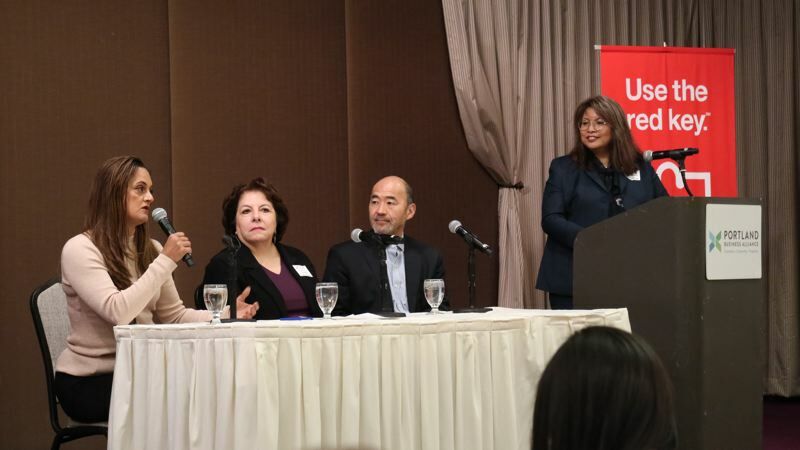 Three leaders in the Portland business community discuss issues faced by minority businesses at January's PBA breakfast forum. "At the Portland Business Alliance, 80 percent of our nearly 1,900 members are small businesses. We are committed to supporting women and minority-owned businesses through our programs, partnerships and events. In this year alone, of our new members, one in four identify as a minority, women or veteran business enterprise," Robertson said. Castillo said her organization started in 1993 in response to counter negative stereotypes of Latinos that were similar to what is being said today. "They were saying we were all illegals, that our children were all gang bangers, that we were taken jobs away from Americans. We wanted to get the word about the contributions were making and our successful students," said Castillo, saying that the organization current provided bilingual counselling Latino small buisness owners to help them grow. Yamamoto said his organization provides a range of services to minority small business owners, including microloans and networking events. The most recent one featured a presentation by the Port of Portland about its $1.2 billion Portland International Airport concourse expansion project, where 20 percent of the funds have been set aside for small minority-owned businesses. "That's $240 million over three to five years," Yamamoto said about the contracting opportunities presented at the meeting. Chaud admitted that women and minorities can face additional barriers to starting businesses and even finding employment. For example, she did not speak English when she first moved to California to attend college from Brazil. But Chaud described many of the challenges she faced when starting Garden Bar as similar to those faced by anyone starting a small, unconventional business. "I operate a fast casual concept restaurant. I had to convince people that salads could be a meal. I had to compete against a chain for a location I wanted in the Pearl District for my prototype. I worked a second full-time job to show I was viable and had skin in the game," Chaud said. Castillo, Yamamoto and Chaud all agreed that rapidly increasing costs pose a threat to the growth of women- and minority-owned small businesses. Each of them cited the example of San Francisco, where costs are so high, that it has become unaffordable for those with lower incomes. "You have to be able to earn a living wage. We have to invest in the workforce, including education and technical training," said Castillo.